MIAMI – It was announced today that HBO has renewed Westworld, Divorce and Insecure for second seasons. Westworld kicked off its ten-episode first season October 2nd on HBO, debuting hour-long episodes Sundays at 10:00pm AST*. 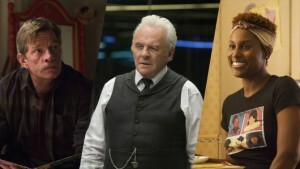 Created for television by Jonathan Nolan & Lisa Joy, both of whom executive produce and write, with Nolan directing, the series is based on the 1973 film "Westworld," written by Michael Crichton.The cast for the first season of Westworld includes Anthony Hopkins, Ed Harris, Evan Rachel Wood, James Marsden, Thandie Newton, Jeffrey Wright, Tessa Thompson, Sidse Babett Knudsen, Jimmi Simpson and Rodrigo Santoro, among others. The comedy series Divorce follows Frances, who has suddenly begun to reassess her life and her strained relationship with her husband after more than a decade of marriage and two children. But she soon discovers that making a clean break and a fresh start is harder than she thought. Serving as an executive producer, Sarah Jessica Parker stars as Frances in the series, which is created by Sharon Horgan. Thomas Haden Church stars as Frances' husband, who is struggling to cope with their marriage falling apart. Created by Issa Rae and Larry Wilmore, the comedy series Insecure explores the contemporary black female experience in an unclichéd and authentic way. Rae and Yvonne Orji stars as best friends who must deal with their own real-life flaws as they attempt to navigate different worlds and cope with an endless series of uncomfortable everyday experiences. Divorce and Insecure kicked off their ten-episode first seasons October 9th on HBO, debuting new half-hour episodes every Sunday at 11:00pm and 11:30pm AST*, respectively. All episodes of Westworld, Divorce and Insecure are available on HBO GO after their premiere on HBO. HBO GO is available on www.hbogola.com, downloading the mobile app (for iOS or Android) or on Xbox 360 (for Xbox Live users).